Some Republicans' digs at Wendy Davis' performance in the Democratic primary on Tuesday have obscured the fact that turnout was down for both parties compared with 2010. Much of the partisan analysis of Tuesday's primary elections parceled out across social media has focused on trying to spin Wendy Davis' victory in the Democratic gubernatorial primary as a loss. Davis won 79 percent of her party's vote, but Republican critics have noted that her totals (if not her percent of the vote) ran well below what Bill White received four years ago. They've also highlighted her loss in more than two dozen counties to an unfunded challenger with a Hispanic surname. More than half of those were in South Texas, most notably in the counties that include Laredo and McAllen. GOP consultant Ted Delisi, for instance, called Davis' loss in Hidalgo County "a danger sign." The numbers are true, but as isolated data points, they miss out on a larger context: Turnout in both parties in the marquee race for governor fell from 2010 to 2014, though the drop-off was more pronounced in the Democratic contest. About 546,000 Democrats took part in the gubernatorial primary on Tuesday, down nearly 20 percent from the roughly 681,000 who voted in 2010, when White faced six little-known candidates, who included two contenders with Hispanic surnames. In the GOP gubernatorial primary, turnout this year was down about 10 percent from 2010. About 1.5 million Republicans voted four years ago in the showdown featuring Gov. Rick Perry, U.S. Sen. Kay Bailey Hutchison and Tea Party activist Debra Medina. 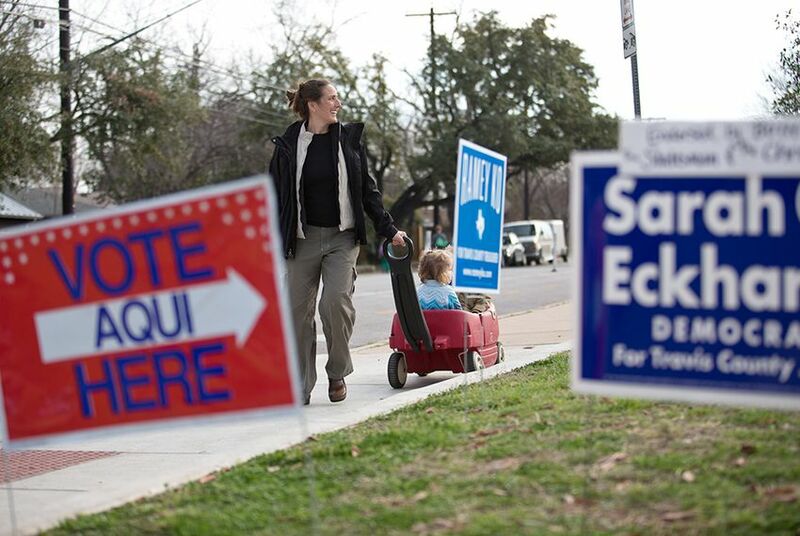 This year, with Abbott facing nominal opposition, turnout dropped to just over 1.3 million. University of Houston political science professor Richard Murray said the diminished participation rates for both parties reflect a broader national trend of the declining popularity of primary contests. That trend is particularly pronounced in non-presidential election years. Michael McDonald, a professor at George Mason University who studies voter turnout, said the evidence for dwindling turnout in primaries across the U.S. is anecdotal but widespread. He added that he has fielded about 20 inquiries over the past couple of years from reporters throughout the country asking about lower turnout where they are. He warned against reading too much into anecdotal evidence. "But," he said, "my sense is this is not an aberration. It's part of a long-term trend." Party primaries were a product of the progressive movement in the early 20th century, and turnout was highest in the decades directly after the progressives were at the height of their influence. Primary contests' importance was even more pronounced in southern states, where turnout often exceeded general-election turnout. That phenomenon reflected a strategy at the time among southern states — including Texas — of creating whites-only primaries as a way to exclude blacks from the political process. Laws creating white primaries were overturned by the courts, but southern states still found ways to exclude blacks from voting. After passage of the Voting Rights Act, those vestiges of overt racism at the polling place faded, leading to a shift in voter participation away from the primary to the general election, McDonald said. McDonald urged caution when trying to draw conclusions about specific primary contests. Those races tend to be "very idiosyncratic," and turnout can depend heavily on factors like timing. For instance, presidential primary turnout tends to drop in states that are later on the primary calendar because the nominee has often been selected by then, he said. Also, if polling shows a clear front-runner — as was the case in both party primaries in Texas this year — voters are often less interested in showing up, McDonald said. In Texas, the trend was exacerbated this year by a lack of competitive races on the Democratic side, Murray said. Only four of 12 statewide contests on the Democratic ballot had more than one candidate. On the Republican side, only one of 15 statewide races drew just a single candidate. For candidates at the top of the ticket, that means there's less of an incentive to spend money in a primary contest when those resources could be used better in the general election. “There’s no reason to invest resources in a low-vote primary where you don’t have much at stake,” Murray said. And that points to one possible reason for Davis' unexpectedly poor showing in South Texas. McDonald said voters who haven't had much engagement with a front-running campaign rely on "low-information cues" at the ballot box. In primary races, where the candidates are all from the same party, those cues include the familiarity of a last name. In parts of South Texas, where Hispanic voters predominate, that may explain why more votes went to Davis' opponent, Ray Madrigal. McDonald added, though, that those voters would likely vote for Davis in the fall, when the stronger cue of party affiliation reasserts itself. Phillip Martin, deputy director of the liberal advocacy group Progress Texas, said that Davis and an allied effort, Battleground Texas, reported spending $1.5 million less on their final pre-primary fundraising reports than White did four years earlier. Martin said that White, who was mayor of Houston before running for governor, needed to spend money to build up his name ID. Davis, he said, already has high name ID, freeing up her campaign to devote more resources to establishing the necessary field operations for the general election. Delisi said turnout this year on the Republican side exceeded expectations, even if it lagged behind 2010. Without a race at the top of the ticket like Hutchison vs. Perry, as well as unusually cold weather in parts of the state, some GOP consultants expected turnout as low as 1.1 million, Delisi said. So with turnout north of 1.3 million, "I have not heard from any of my colleagues who said we didn't exceed expectations," he said. Delisi said it's important for a party to draw voters to a primary. Ninety-eight of primary voters return in November to vote in the general election, he said, and 95 percent will back the party's nominee. So, Delisi said, getting voters out in March is like banking support that can be counted toward the November turnout goal. "That's one more person I don't have to worry about in the general," he said.